Is it May already?! That's fairly insane. The end of the school year?! It's just amazing to me how quickly these years go by. It seems like just yesterday I was writing to you all about selecting our new leader team at Collin for this school year, and now with one full year of ministry under their belts, many on that team are heading off to others schools to continue their education and their work for Christ. Crazy. With the end of the year comes a lot of neat experiences that causes the community and I to give thanks to God for all he's done this year. One of the neat times we have is our Collin Banquet. We dress fancy (or if you're me, like Forest Gump), we eat, we worship, and we reflect. 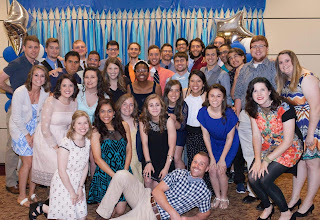 The banquet this year was big and fun; we watched a slide show that had pictures of our students from the year, and heard from staff as we honored our student leaders (corefas) for the hard work they've done this year. It was a great blessing! Unlike many years where the year ends but I keep some people on my staff team, this year I will be saying goodbye to all the people on my staff. Matthew Evans (pictured back center), an intern, will be leaving to pursue another degree at UTD. Matt has been a blessing to have on the team, a compassionate hard-worker, and a capable minister. JD (pictured far right), an intern, will be pursuing another degree at UTD as well. JD Pearson has been a great part of our team, a good friend to myself and students, and thoughtful as a minister. Albert Rodriguez (pictured front right), an intern, is off to Sam Houston State University to pursue his degree and training as a dietician. Albert's been a community builder and a great mentor to his students. Katelyn Hoffman (pictured front left), an intern, is leaving to pursue a career in early childhood intervention. Katelyn has been a great leader of students, very thoughtful and kind, and fun to have on our team. And finally, Danielle Rodriguez, a senior staff minister, has been at Collin for 2 years and is now moving to the Denton team with Focus because she's getting married to my friend and co-worker in Christ, Matt Clark. Dani's work on our team these past two years has been indispensable. She's helped build the women's side of our ministry, she's smart, hard-working, and is a great pastor for students. I'm looking forward to seeing her continue her work up at TWU and UNT! I'll miss these friends and co-workers very much, but look forward to our continued friendships. Finally, our crew is about to leave for SICM (Student Institute of Campus Ministry) up in Bellingham, Washington. I talked about this in my last update, but it's a week-long, intensive campus ministry training for students we hand-picked to go learn how to lead their peers. Please be praying for that trip as it is our most important resource over the summer in training new leaders for the coming school year. Summer Focus starts in a few weeks and I'll have more to tell you then! Thank you so much for your continued support and prayers. Blessings!